If you're interested in a career in the motion picture business, consider complementing your school curriculum with hands-on experience, direct access to industry professionals, and unparalleled networking opportunities at the world-renowned Cannes Film Festival. For 29 years, The American Pavilion has been the heart of Hollywood's presence at Cannes, and AmPav's worldwide Student Programs have helped students launch their careers in the film industry. 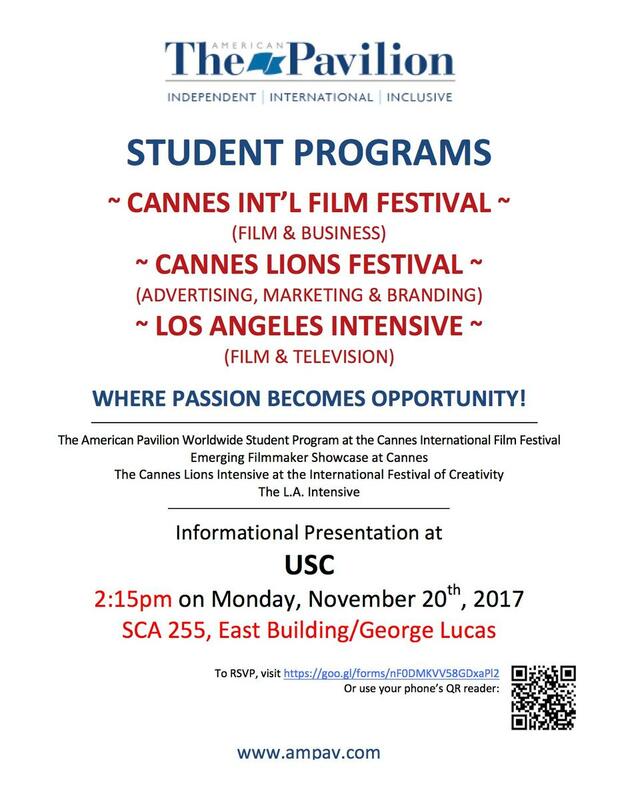 As the only student program officially recognized and sanctioned by the Festival del Cannes and the Marché du Film, The American Pavilion Student Programs offer participants a unique and life-changing experience, and an up-close view of both the Festival and the Market. For students interested more in content creation for marketing brands, consider AmPav’s Cannes Lions Intensive, also taking place in Cannes, just 3 weeks after the film festival. For more information, go to www.ampav.com.